It’s like having one of those embedded, infected splinters that was just too tiny to grab finally pulled out of your flesh. I can’t really express how grateful I am not to have to wake up in the morning and face the Next Stupid Thing he had said or done. Further, Obama has already pretty much put his foot down on the discrimination faced by the gay and transgender communities, including speaking directly against the absurd “don’t ask, don’t tell” military cowardice. His inauguration speech contained solid declarations against much of what the Bush administration stood for; and he has put a halt to all pending regulations until they can be reviewed by his administration. It’s as if we have an actual leader. Deb created the “sea” out of stained glass, and I mounted it in a box to protect it. 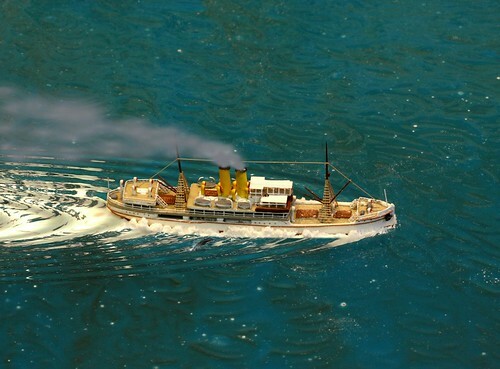 The ship is about 2 and 3/4ths inches long; the wake is powdered flour and an application of WinImages’ “radial wave” effect using layers to separate the ship from the water. The “smoke” is also a WinImages effect. I took the shot with a Canon EOS 40D and Canon’s 100mm macro lens. For more details, just click on the image.